The current article series deal with a very useful and powerful PowerShell command named – Search-Mailbox . I relate to the Search-Mailbox PowerShell command as a “Swiss Knife” because we can use the Search-Mailbox PowerShell command for many types of scenarios. What does the Search-Mailbox PowerShell command do? The Search-Mailbox PowerShell command as the name suggests, serve as a tool for the Exchange administrator to perform a search in Exchange mailboxes (or multiple mailboxes) for specific mail items. The term “mail items” relate to any type of mailbox items such as – E-mail message, calendar meeting, contact, task and so on. The Search-Mailbox PowerShell command has four distinct and special characters. Associatively, we can assume that the term “Search Results” translates into some kind of index, which lists all the search findings (Log file etc.). The interesting thing about the Search-Mailbox “Search Results” is that the “Search Results” realized as a copy of the original mail items that answer our search query. For example, if we use the Search-Mailbox PowerShell command to look for E-mail message with a specific text string in Bob’s mailbox, the Search-Mailbox PowerShell command enables us to copy the mail items that answer our query (the “Search Results”) to another store (the Target mailbox which will be discussed later). 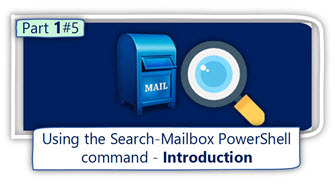 As mentioned in the former section the Search-Mailbox PowerShell command can help us to look (search) for specific mail items stored in Exchange mailbox and copy this mail item to another store (another Exchange mailbox). An addition “action” that can be implemented by the Search-Mailbox PowerShell command is a very interesting and powerful action – Deletion of mail items (Deletion of the “Search Results”). Besides of a new Office 365 PowerShell command named – New-ComplianceSearchAction, the Search-Mailbox PowerShell command is the only command that enables Exchange administrator to “remove” (Delete) specific mail items from Exchange mailbox or Multiple Exchange mailboxes. 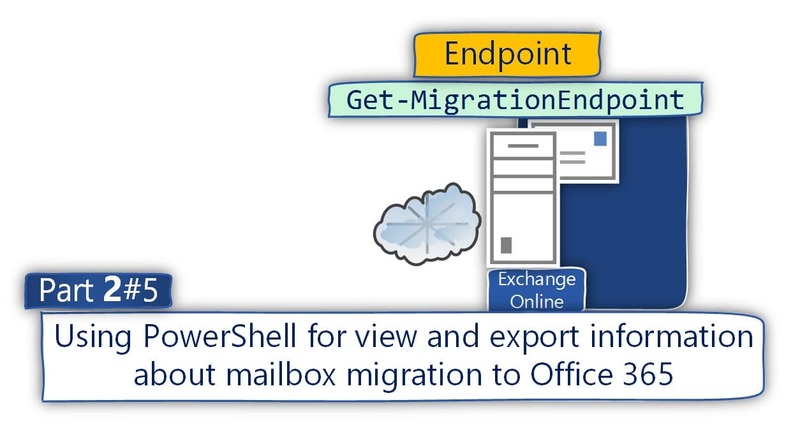 The Search-Mailbox PowerShell command enabled us to define specific “location” of the Exchange mailbox in which the search action will be implemented. For example, we can instruct the Search-Mailbox PowerShell cmdlet to perform a search only in the special hidden mailbox folder named – the Recovery mail folder (the Dumpster) that serves as a dedicated store for Soft Deleted and Hard Deleted mail items. The Search-Mailbox cmdlet enable us to define almost every possible parameter for defining our search query such as – sender, recipient, date, the type of the mail item, specific Text string and much more. In addition, we can use a very sophisticated search query that combines many different types of filters such as – show only calendar items from a specific date that have a specific subject. Part B – In this part, we define the specific characters of the search query that we need to perform. For example, search for mail items that include a specific text string. Part C – In this part, we define the specific “action” that we want to apply to the Search Results we get from the former parts. In this scenario, the PowerShell command syntax is implemented by “declaring” the search scope, meaning the Exchange mailboxes for which the search task will be carried out. Then we “pipe” the Exchange mailbox group to the Search-Mailbox PowerShell command. The Search-Mailbox PowerShell cmdlet supports very powerful syntax that defines the Search Query (the Search filter or the Search criteria). The search Query is implemented by using the parameter – SearchQuery + the specific filter that we want to use. The search filter can be implemented as a simple search query or, as an advanced search query that is written by KQL language. We can define a search filter that looks only for specific types of mail items. Search-Mailbox <Source Mailbox> -SearchQuery “Kind: meetings"
Search-Mailbox <Source Mailbox> -SearchQuery “Kind: <strong>contacts</strong>"
Search-Mailbox <Source Mailbox> -SearchQuery from:"<E-mail address>"
Search-Mailbox <Source Mailbox> -SearchQuery to:"<E-mail address>"
We can perform a search query that relates to the “date” of mail items. Search-Mailbox <Source Mailbox> -SearchQuery attachment:"<Attachment file name>"
Create a Log File – this option can be used in case that we don’t want to get a copy of the mail items (the search result) but instead, only a “report” (Log) that include information on the mail items that were found. Copy the mail items (the search results) to “another” mailbox – this option can be used in a scenario in which we want to recover or save mail items that appear in the search result. Delete the mail items that were founded – this option can be used in a scenario in which we want to “destroy” (delete) the specific mail items. For example, a scenario in which our organization was attacked by a virus, and we want to locate all the infected mail items and delete them. 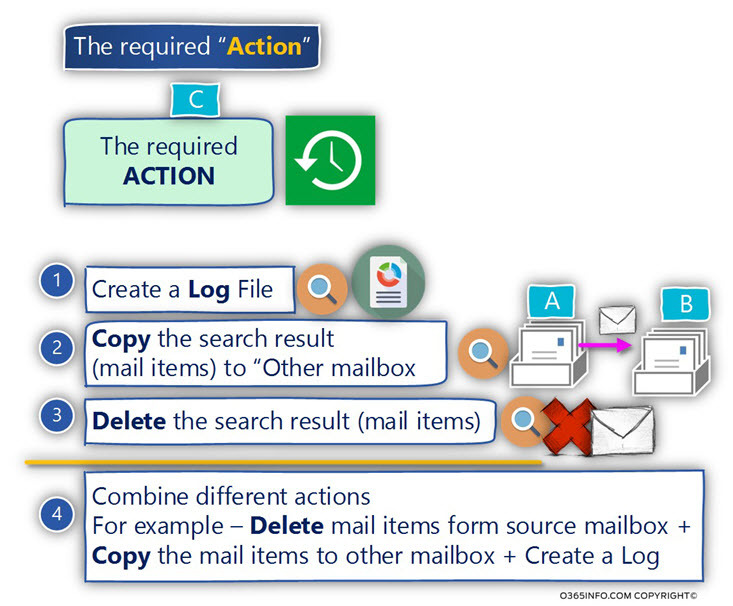 In addition, we can choose to “combine’” couple of “actions.” For example, we can define an action in which the mail items will be deleted from the source mailbox, but in addition, a copy of the mail items will be saved in a “target mailbox” + create a Log file that includes information about each mail items that appear in the search results. As mentioned, most of the time the action of “Search Results” is translated to a Log file or, to a copy of the mail items that was found in the search process. To be able to “store” the “Search Results” (the Log file or the mail items that were found), we need to define a “target store” meaning – Target Mailbox. In addition, we need to define a Target Folder that will be created, and that will contain the search results. The Search-Mailbox cmdlet will need to “know” – what is the Source Mailbox, what is the Target Mailbox (that will store the search results) and what is the name of the Target Folder. Given that we provide the name of the Target Folder name, the Search-Mailbox cmdlet will create this NEW folder in the Target Mailbox. As mentioned, the Search-Mailbox cmdlet creates the Target folder (based upon the Target Folder name whom we provide as part of the PowerShell command) in the Target Mailbox. The Target Folder serves as a “store” for the search results, and have a specific hierarchy. In the following diagram, we can see the structure of the Target Folder. This is the name whom we provide as part of the Search-Mailbox command mandatory parameters. The “folder name” that stores the search result is built from a combination of the Source mailbox display name + the current search time. Notice that the “Time” that appears as part of the folder name considers as “GMT +0”. The meaning is that in most of the scenarios, the search results “time” that appears as part of the folder name is a different time than your current \local time. In case that you want to adjust the time to your local time zone, you will need to add or subtract the hours based on your local GMT. In my scenario, the “real time” is 13:13 (10:13 + 3 hours). Search-Mailbox cmdlet creates a folder named – Primary mailbox. This term relates to the “standard user mailbox” which defines as – Primary mailbox. The reason that the Search-Mailbox cmdlet refers uniquely to the standard mailbox is because that theoretically, an Exchange user can have additional mailbox or a secondary mailbox which describes as the Archive mailbox. As mentioned, one of the most powerful abilities of the Search-Mailbox cmdlet is, the ability to search and “export” (copy) mail items stored in the Recovery mail folder (Dumpster). 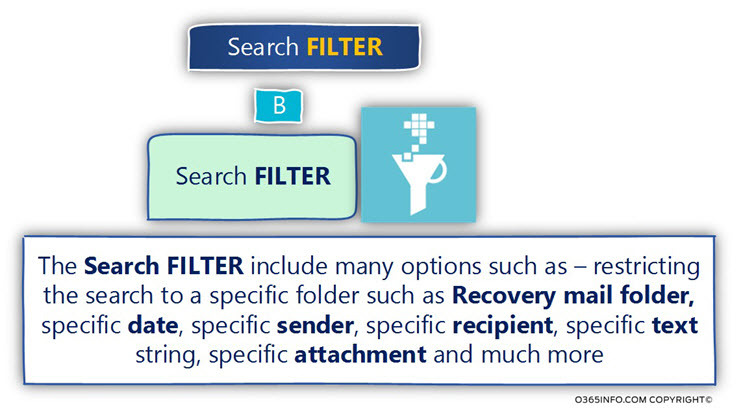 In case that the search results include mail items that were stored in the Recovery mail folder (Dumpster), a new folder named – Recoverable items will be created. 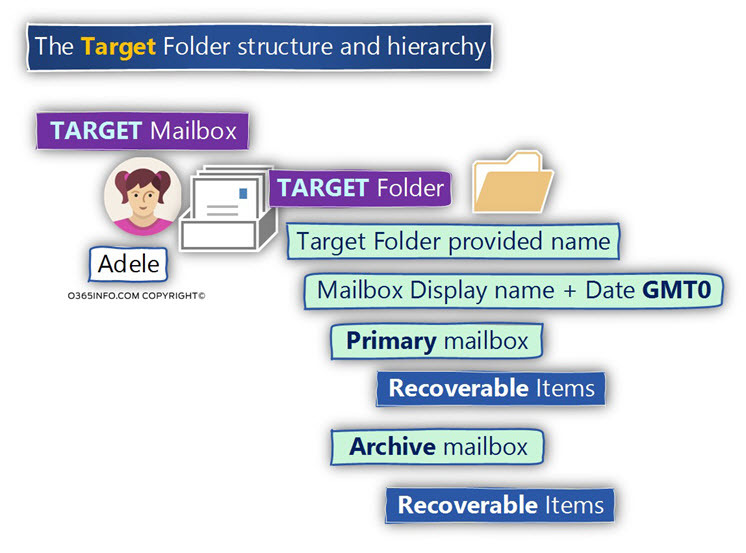 Note – the mailbox owner cannot see the Recovery mail folder (Dumpster) because this is a hidden folder. Only the Exchange administrator who performs the search has the “privilege” to view this folder and the folder content as part of the search results that stored in the Target Mailbox (in the Target folder). This folder name “appears” only in a scenario in which the Source Mailbox has Archive (additional mailbox). The Recovery mail folder (Dumpster) space. By default, the Search-Mailbox cmdlet will look (search) for mail items in all three parts above. For example, a scenario in which we need to recover mail items that were Soft Deleted or Hard Deleted by the user. 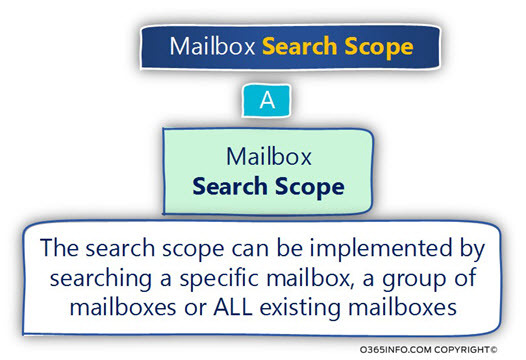 In this case, we want to define a very specific mailbox scope – the Recovery mail folder (Dumpster). In this case, we want to perform a mailbox search, but we don’t want that the search will run on the Recovery mail folder (Dumpster) of the Source Mailbox. Using the Search-Mailbox cmdlet for “snooping” Exchange mailboxes require a special permission because from the “data privacy point of view,” we are looking at a private user data. In case that we use the Search-Mailbox cmdlet for deleting mail items, we are deleting private user data. Mailbox SearchThis role allows you to search for messages across multiple mailboxes in your organization. Administrators aren’t assigned this role by default. To assign yourself this role so that you can search mailboxes, add yourself as a member of the Discovery Management role group. See Assign eDiscovery permissions in Exchange. Mailbox Import ExportThis role allows you to delete messages from a user’s mailbox. By default, this role isn’t assigned to any role group. To delete messages from users’ mailboxes, you can add the Mailbox Import Export role to the Organization Management role group. For more information, see the “Add a role to a role group” section in Manage role groups . The Search-Mailbox cmdlet have two limitations that we should know about. The Search-Mailbox cmdlet can perform a multiple mailbox searches for a maximum of 10,000 mailboxes. When we use the Search-Mailbox cmdlet + a search query, meaning using the –SearchQuery parameter, the results are limited to a maximum of 10,000 results. Sooo well written, seems like I am reading Archies. The best article in this whole world and millions of websites / forums. Extremely well written, thank you, and great work! A nice addition would be to flesh out the Search-Mailbox cmdlet to include multiple parameters that would return search results on emails that meet criteria of Subject AND From address for example.